We see variations on these all the time. But what do they actually mean? Is there a hierarchy? Glyn Wintle was quick to spot the implications of the statement that the government had asked Facebook to remove a page it didn’t like – the Raoul Moat tribute page. I am personally very uncomfortable about the Gov telling Facebook it should remove a group because the Gov does do not like it. “When does it become Gov?”, he later added. I don’t know. Do you? There is certainly a difference between an MP asking for something in the House, and the formal machinery of the state swinging into action to making things happen. But where does “No.10 asking” fit in? I have absolutely no idea. But I’m not that comfortable with it either; in whose name is it doing the asking? Digging carefully into the media, some reports were explicit about the No.10 involvement – some just mentioned the MP’s request and that the Prime Minister confirmed it was a “very good point”. Ultimately, the nuances don’t matter to anyone other than keen observers of Westminster protocols – the public impression is that a freedom-limiting manoeuvre has been made by the government of this country without any clear mandate, process or instrument involved. And that’s worth appreciating. Thanks Glyn. The government (whether an individual minister or collectively) can ask anyone to do whatever they like but they can’t compel their action unless they have a specific ministerial power or responsibility to do so. In this particular case, Mr Cameron was asked by a backbencher whether he would ask Facebook to remove the group supporting Raoul MMoat. Mr Cameron’s response was that he deplored what some members of the group were saying but at no time did he give any indication he would request Facebook to close the group and he certainly does not have the power to compel them to. So contrary to the impression being reported, Mr Cameron was tacitly supporting the free speech of that Facebook group. which is the reference that Glyn used (along with Radio 4 though I don’t have a transcript of that). So is David Cameron playing on the side of free speech or not? Can’t have it both ways, surely? Anyone – even a Downing St (political) official – can call up FaceBook and ask them to do something. The problem is that when it’s the Prime Minister’s office that’s calling, there may be an implied threat in it: if you don’t do what we ask, we’ll legislate to make you do it – a threat that FaceBook is probably big enough and ugly enough not to bother about. It’s the kind of moral panic which famously led to the Dangerous Dogs Act in 1991 – tabloid-fuelled, ill-conceived, badly-drafted legislation which nobody can repeal but nobody wants. Governments – as this government appears to have stated – should intervene only where they can contribute, and matters of taste and decency is not something to which Governments can contribute. Not a constitutional issue, I don’t think: a political one. I would be astonished if he were foolish enough to make representations to Facebook about this but it certainly remains to be seen. 1. Is the reported story that the Facebook group owner voluntarily removed it correct? Were they pressurised to do so by Facebook, whether after contact from Number 10 or otherwise? 2. How would this have played out if the group had been hosted on an entirely independent website or on a social network that doesn’t have as close a relationship with the government as Facebook? This is a very interesting constitutional question which, alas, I do not have the answer too. So to throw in some random thoughts, if the Prime Minister does not like something and asks Facebook to remove it, is that the government speaking? I would suggest not. It is the Prime Minister. Forgive the obviousness of that statement but it is made in the interests of attempted clarity. Agreed that the definition of a PM is the head of government, but he or she isn’t THE government itself. So back to the dictionary. Government: the organization that is the governing authority of a political unit. So by that definition, collectively the governing party (or parties in the case of the collation) would need to agree that FB should take the page down for it to be considered government policy or a statement. The constitutionally important distinction is between HM Government (which is the Crown) and Parliament. They share a large number of personnel but they are distinct institutions, which is why the Prime Minister is appointed by the Queen but remains in office even during the dissolution of Parliament (when he ceases to be an MP). The Government is the governing arm of the monarch, and cannot forbid things without Parliament’s approval. In fact there was a specific relevant case in 1610, known as “the Case of Proclamations”, in which the King (for which read David Cameron) tried by proclamation to make the building of houses on greenfield land outside London illegal, to constrain the growth of the city. 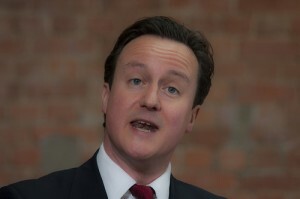 So David Cameron as the head of Government (Prime Minister is a role recognised only in custom and has no statutory foundation – in fact was not even mentioned in statute until the 20th century) can say that something is not OK, and use what Americans call the bully pulpit to suggest that people shouldn’t do it, but as a member of the Government he cannot ban it. He can, of course, as a member of Parliament and leader of the controlling majority, ensure that Parliament passes an Act to ban it, but that’s acting in a different role. In the same way, MPs cannot ban things individually, but can act collectively to do so – as long as the Government, with control of the Parliamentary timetable, allows them. Rereading my comment, the thing to add is that David Cameron stands in relation to the Government as he does to Parliament. Statutorily no different from any other member, but in practice in control of what it does. So decisions of the Government are decisions of the Cabinet, and are taken through a number of Cabinet committees, ending with a Cabinet decision. That’s the formal practice, but of course in reality any proposal which the Prime Minister didn’t agree with would be stopped through the administrative machinery long before that. As I understand it, Number 10 contacted Facebook to make them aware of the prime minister’s comments in PMQs (this is what the BBC reported as well). Facebook then issued a statement saying that they would not take down the page, as it does not contravene their T&Cs. Facebook later issued a statement after the page was taken removed that they did not take it down themselves. So it would appear the page’s creator responded to the pressure, rather than Facebook. I don’ t think there’s anything inaccurate in my story, and I deliberately didn’t write that “Number 10 asked Facebook to take the page down” because it wasn’t clear whether that’s exactly what they did. But one could argue that the inference was there [EDIT: as in, when Number 10 got in touch with FB]. One interesting further question to pursue might be: what/who prompted the Tory backbencher’s question (which started the whole row) in the first place?